Ah, luminous pink – the color of summertime refreshment! 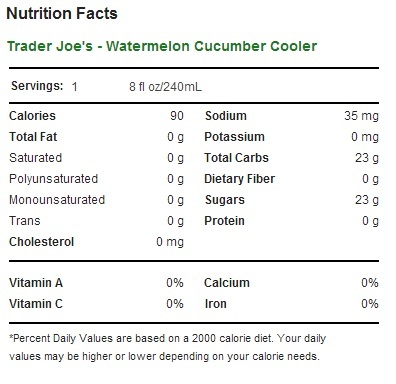 Trader Joe’s Watermelon Cucumber Cooler is one of those surprising products that doesn’t quite seem to fit at Trader Joe’s. Do-it-yourself fusion sushi? Sure. Popcorn seasoned with brown butter and french herbs? Why not. But a watermelon cooler? A summery, watermelon drink called a “cooler”. That seems oddly plebeian on the shelves next to Trader Joe’s French Market Sparkling French Berry Lemonade, and Trader Joe’s Italian Blood Orange Soda. As much as I like Trader Joe’s, my blue collar roots sometimes rebel at the rather fancy image Joe likes to cultivate for himself. It’s a bit of a relief to see them throw the word “cooler” around on a relaxed summer drink – much in the tradition of Cactus Cooler and HI-C’s long mourned Ecto-Cooler. That may sound like I’m trying to damning this product with faint praise, but I mean it genuinely. Whether it’s pink lemonade or cherry coke, summer is the time for unnatural sugary drinks to bring out the kid in us. It’s the time for pretensions to fall to the way side and kick back with a nickle glass of Kool-aid and a slice of watermelon. It’s in that very spirit that Trader Joe’s has given us this Watermelon Cucumber Cooler – a jug of refreshing, sweet and tasty juice flavored beverage. There’s not much to dislike with this beverage. What you see is what you get. Pour yourself a cool cup and you’ll taste exactly what it promises on the side, a sugar-sweetened, watermelon-flavored drink with the cool aftertaste of cucumbers. I’m actually a fan of cucumbers in water. There’s something about the long, mellow aftertaste of a chilled cucumber that seems to slake the thirst as much as the water itself. The unsweetened cucucumber presence in this drink makes for an elegant grace note to what could have easily been one more too-sugary fruit drink. The Watermelon Cucumber Cooler strikes a balance closer to the unsweetened end of the drink spectrum than the overly sweet end. That makes it a rare participant in the summer drink wars – a beverage that satisfies the sweet tooth, quenches the thirst, refreshes with cucumber, and goes easy on the sugar. Pairing watermelon off with cucumber in the first place might seem like a random choice – but not so random as it sounds. Both watermelon and cucumber are close cousins in the plant kindgom, siblings of the Family Cucurbitaceae, known generically, along with gourds and such, as curbits. This familial association makes for a fine flavor pairing, with the strong watermelon flavor blending seamlessly into the more understated cucumber, leaving you uncertain as to where the one taste ends and the other begins. Shine on you crazy curbits! Sure, there’s still 23 grams of sugar per glass, but at least it’s from organic sugar and watermelon juice and not high fructose corn syrup. It’s not a health drink by any stretch of the imagination, just a fresh and refreshing take on the summer drink scene. If you’re not on the bad wagon with cucumber water to begin with, there may not be much here for you. If, on the other hand, you like cucumber water or have simply never tried it, I’d recommend this drink to quench your summer thirst. Would I Recommend It: Yes – as long as you’re okay with the flavor of cucumbers. Would I Buy It Again: I’ll pick one up the next time I head down to the beach. Final Synopsis: A refreshing, sweet-but-not-too-sweet summertime libation. Love this drink. Went back today for more only to learn it is discontinued …NOOOOO Please Joe – bring this item back to your shelves asap. me too, been going back every week for this amazing drink! bring it back or if anyone knows where else this is being sold…. DO TELL!!!! BRING BACK THE WATERMEOLN CUCUMBER COOLER PLEEAASSEEE!!! I tried it for the first time just a couple months ago, and when I returned to buy a couple more bottles, they’d sold out! Argh! I love it over ice. Is there aupposed to be studlff floating in it?